The horticultural LED XMAX V4 range has improved spectrum to have a higher PPF ( photosynthetic photon flux ) than previous models to give better yields. They also have new housings for better airflow. 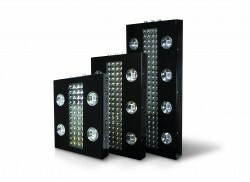 The lights are equipped with high-end fans for durable and silent cooling.